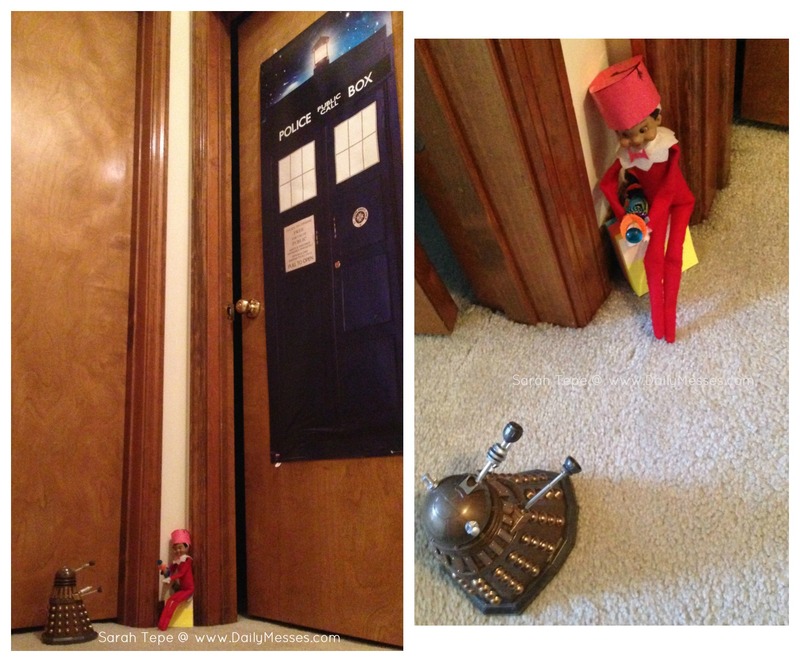 When I tucked Bernardo into bed the other day, I saw his Dalek Yahtzee game on his self and it gave me a new Elf idea. There are some big Doctor Who fans in our house. In fact, Bernardo loves Doctor Who so much, that he had a Doctor Who themed birthday party this year, which gave me a few props to use. He has a Tardis poster on his door, as well as the Sonic Screwdriver he made at the party. I propped Eugene (the Elf) up on some note cards, placed the Sonic Screwdriver in his hands, and dressed him up with a fez and bow-tie (Bernardo's favorite Doctor is #11). I then placed the Dalek close to the elf. I wonder who will be exterminated? Now if only Eugene could bring the new season of Doctor Who to Netflix faster, we would all be happy!